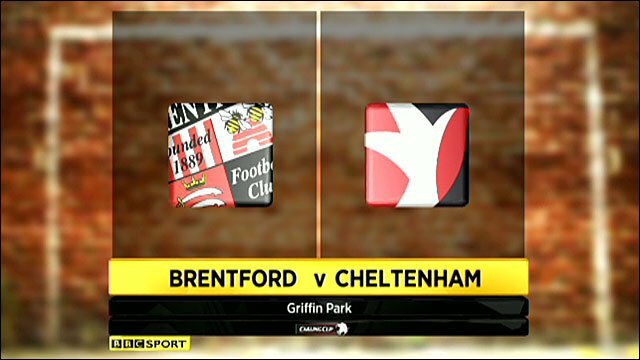 Brentford edged into the second round of the Carling Cup with their first ever win against Cheltenham. The hosts hit the bar twice through defenders Karleigh Osborne and Leon Legge before loanee Robbie Simpson made the breakthrough. Fellow new boy Craig Woodman doubled the Bees' advantage from a free-kick four minutes later. Sean Jeffers slammed home a rebounded shot past keeper Simon Moore to give Cheltenham hope but Brentford held out. "The second half in particular we were good. It was just a 10-minute spell where we conceded a couple of soft goals that cost us, but I think we've shown what we can be about. We've just got to get a ruthless streak in us. "Scott Brown's got to look at his starting position for both goals. The first one was a decent cross but I thought his position was wrong, and the second one he let the back four get on top of him. It didn't look good from our point of view. "In the second half we had a go and there's plenty to work on. For all but a sloppy 10 minutes I thought we were excellent." 93:27 The match gets underway. 90:00+2:45 Foul by John Melligan (Cheltenham) on Sam Wood (Brentford). Direct free kick taken left-footed by Craig Woodman (Brentford) from left wing, passed. 90:00+2:01 Foul by Steve Elliott (Cheltenham) on Leon Legge (Brentford). Direct free kick taken right-footed by Simon Moore (Brentford) from own half, resulting in open play. 90:00+0:43 Inswinging corner from left by-line taken right-footed by Michael Pook (Cheltenham) to far post, resulting in ball out of play. Goal kick taken long by Simon Moore (Brentford). 89:27 Defending throw-in by Danny Andrew (Cheltenham). 88:36 Header by Pim Balkestein (Brentford) from centre of penalty area (12 yards), over the bar. Goal kick taken long by Scott P Brown (Cheltenham). 88:19 Attacking throw-in by Craig Woodman (Brentford). 87:51 Defending throw-in by Craig Woodman (Brentford). 87:26 Defending throw-in by John Melligan (Cheltenham). 85:05 Cross by Sam Wood (Brentford), clearance by Danny Andrew (Cheltenham). 84:52 Attacking throw-in by Craig Woodman (Brentford). 83:47 Defending throw-in by Danny Andrew (Cheltenham). 82:42 Cross by Charlie MacDonald (Brentford), clearance by Danny Andrew (Cheltenham). 82:14 Cross by Sam Wood (Brentford), header by Charlie MacDonald (Brentford) from right side of six-yard box (6 yards), clearance by Steve Elliott (Cheltenham). 81:45 Attacking throw-in by Danny Andrew (Cheltenham). 81:29 Defending throw-in by Karleigh Osborne (Brentford). 79:29 Shot by Sam Wood (Brentford) left-footed from left channel (25 yards), save (caught) by Scott P Brown (Cheltenham). 79:12 Attacking throw-in by Craig Woodman (Brentford). 78:48 Attacking throw-in by Craig Woodman (Brentford). 78:01 John Melligan (Cheltenham) caught offside. Indirect free kick taken right-footed by Simon Moore (Brentford) from own half, resulting in open play. 76:24 Shot by Robbie Simpson (Brentford) left-footed from right side of penalty area (12 yards), save (parried) by Scott P Brown (Cheltenham). 75:37 Cross by Keith Lowe (Cheltenham), resulting in ball out of play. Goal kick taken long by Simon Moore (Brentford). 74:47 Substitution Cheltenham substitution: Jeff Goulding replaced by Robin Shroot (tactical). 74:37 Defending throw-in by Craig Woodman (Brentford). 73:06 Attacking throw-in by Brian Smikle (Cheltenham). 72:05 Substitution Cheltenham substitution: Joshua Low replaced by John Melligan (tactical). 71:40 Shot by Shaun Jeffers (Cheltenham) right-footed from right side of penalty area (12 yards), save (parried) by Simon Moore (Brentford). 71:00 Attacking throw-in by Steve Elliott (Cheltenham). 70:28 Shot by Robbie Simpson (Brentford) right-footed from right channel (25 yards), over the bar. Goal kick taken long by Scott P Brown (Cheltenham). 69:34 Defending throw-in by Craig Woodman (Brentford). 68:48 Foul by Gary Alexander (Brentford) on Martin Riley (Cheltenham). Direct free kick taken right-footed by Michael Pook (Cheltenham) from own half, passed. 68:03 Cross by Frankie Artus (Cheltenham), resulting in open play. 67:17 Attacking throw-in by Keith Lowe (Cheltenham). 66:51 Handball by Charlie MacDonald (Brentford). Direct free kick taken right-footed by Steve Elliott (Cheltenham) from left channel, resulting in open play. 66:09 Defending throw-in by Danny Andrew (Cheltenham). 65:19 Goal kick taken long by Simon Moore (Brentford). 64:56 Attacking throw-in by Keith Lowe (Cheltenham). 63:57 Inswinging corner from right by-line taken right-footed by Danny Andrew (Cheltenham) to centre, clearance by Leon Legge (Brentford). Inswinging corner from left by-line taken right-footed by Michael Pook (Cheltenham) to centre, clearance by Craig Woodman (Brentford). 63:20 Substitution Brentford substitution: Nicky Forster replaced by Charlie MacDonald (tactical). 63:05 Cross by Frankie Artus (Cheltenham), resulting in ball out of play. 62:20 Attacking throw-in by Joshua Low (Cheltenham). 59:02 GOAL - Shaun Jeffers:Brentford 2 - 1 Cheltenham Goal by Shaun Jeffers (Cheltenham) right-footed (bottom-right of goal) from right side of six-yard box (6 yards).Brentford 2-1 Cheltenham. 59:02 Foul by Pim Balkestein (Brentford) on Frankie Artus (Cheltenham). Free kick taken left-footed by Frankie Artus (Cheltenham) from left channel (20 yards), save (parried) by Simon Moore (Brentford). 58:36 Shot by Gary Alexander (Brentford) right-footed from left channel (25 yards), save (caught) by Scott P Brown (Cheltenham). 58:09 Cross by Brian Smikle (Cheltenham), clearance by Craig Woodman (Brentford). 57:32 Attacking throw-in by Keith Lowe (Cheltenham). 56:29 Foul by Sam Wood (Brentford) on Michael Pook (Cheltenham). Free kick crossed right-footed by Michael Pook (Cheltenham) from right wing, clearance by Leon Legge (Brentford). 55:21 Foul by Craig Woodman (Brentford) on Shaun Jeffers (Cheltenham). Free kick crossed right-footed by Michael Pook (Cheltenham) from right wing, clearance by Pim Balkestein (Brentford). 54:06 Inswinging corner from left by-line taken right-footed by Michael Pook (Cheltenham) to far post, foul by Steve Elliott (Cheltenham) on Leon Legge (Brentford). Direct free kick taken right-footed by Simon Moore (Brentford) from own half, resulting in open play. 53:43 Cross by Frankie Artus (Cheltenham), clearance by Pim Balkestein (Brentford). 52:35 Foul by Martin Riley (Cheltenham) on Gary Alexander (Brentford). Free kick crossed left-footed by Craig Woodman (Brentford) from left wing, resulting in ball out of play. Goal kick taken long by Scott P Brown (Cheltenham). 52:10 Goal kick taken long by Simon Moore (Brentford). 51:02 Cross by Keith Lowe (Cheltenham), resulting in ball out of play. Goal kick taken long by Simon Moore (Brentford). 49:24 Goal kick taken short by Scott P Brown (Cheltenham). 48:43 Foul by Joshua Low (Cheltenham) on Craig Woodman (Brentford). Direct free kick taken right-footed by Simon Moore (Brentford) from own half, resulting in open play. 47:22 Attacking throw-in by Danny Andrew (Cheltenham). 46:24 Cross by Karleigh Osborne (Brentford), shot by Nicky Forster (Brentford) right-footed from centre of penalty area (12 yards), over the bar. Goal kick taken long by Scott P Brown (Cheltenham). 45:59 Outswinging corner from left by-line taken left-footed by Craig Woodman (Brentford) to centre, clearance by Michael Pook (Cheltenham). 45:00+0:19 Attacking throw-in by Craig Woodman (Brentford). 44:24 Attacking throw-in by Danny Andrew (Cheltenham). 42:54 Handball by Kevin O'Connor (Brentford). Free kick taken right-footed by Michael Pook (Cheltenham) from right channel (30 yards), save (caught) by Simon Moore (Brentford). 41:59 Foul by Robbie Simpson (Brentford) on Keith Lowe (Cheltenham). Direct free kick taken right-footed by Scott P Brown (Cheltenham) from own half, resulting in open play. 40:42 Shot by Gary Alexander (Brentford) right-footed from left channel (25 yards), over the bar. Goal kick taken long by Scott P Brown (Cheltenham). 39:55 Cross by Nicky Forster (Brentford), clearance by Steve Elliott (Cheltenham). 39:14 Outswinging corner from left by-line taken left-footed by Craig Woodman (Brentford) to far post, clearance by Joshua Low (Cheltenham). 38:20 Attacking throw-in by Craig Woodman (Brentford). 37:44 Cross by Robbie Simpson (Brentford), clearance by Steve Elliott (Cheltenham). 37:16 Attacking throw-in by Keith Lowe (Cheltenham). 37:07 Attacking throw-in by Craig Woodman (Brentford). 36:42 Cross by Shaun Jeffers (Cheltenham), save (caught) by Simon Moore (Brentford). 36:20 Gary Alexander (Brentford) caught offside. Direct free kick taken right-footed by Steve Elliott (Cheltenham) from own half, resulting in open play. 34:05 GOAL - Craig Woodman:Brentford 2 - 0 Cheltenham goal by Craig Woodman (Brentford) left-footed (bottom-left of goal) from right channel (25 yards).Brentford 2-0 Cheltenham. 33:35 Cross by Danny Andrew (Cheltenham), clearance by Leon Legge (Brentford). 33:17 Inswinging corner from right by-line taken left-footed by Danny Andrew (Cheltenham) to centre, clearance by Marcus Bean (Brentford). 32:38 Attacking throw-in by Danny Andrew (Cheltenham). 32:31 Attacking throw-in by Steve Elliott (Cheltenham). Correction - 31:51 Foul by Kevin O'Connor (Brentford) on Shaun Jeffers (Cheltenham). Direct free kick taken right-footed by Brian Smikle (Cheltenham) from right channel, passed. 31:51 Foul by Kevin O'Connor (Brentford) on Shaun Jeffers (Cheltenham). Direct free kick taken right-footed by Shaun Jeffers (Cheltenham) from left wing, resulting in open play. 30:31 Assist (cross) by Craig Woodman (Brentford) from left wing. 30:31 GOAL - Robbie Simpson:Brentford 1 - 0 Cheltenham Headed goal by Robbie Simpson (Brentford) (bottom-right of goal) from right side of six-yard box (6 yards).Brentford 1-0 Cheltenham. 30:02 Attacking throw-in by Craig Woodman (Brentford). 29:39 Goal kick taken long by Scott P Brown (Cheltenham). 28:54 Attacking throw-in by Karleigh Osborne (Brentford). 27:52 Shot by Robbie Simpson (Brentford) right-footed from right side of penalty area (12 yards), blocked by Danny Andrew (Cheltenham). Outswinging corner from right by-line taken right-footed by Kevin O'Connor (Brentford) to centre, header by Leon Legge (Brentford) from centre of penalty area (12 yards), hit bar. 27:02 Shot by Gary Alexander (Brentford) right-footed from left side of penalty area (18 yards), missed right. Goal kick taken long by Scott P Brown (Cheltenham). 26:53 Attacking throw-in by Craig Woodman (Brentford). 26:41 Cross by Sam Wood (Brentford), clearance by Steve Elliott (Cheltenham). 26:08 Defending throw-in by Craig Woodman (Brentford). 25:43 Defending throw-in by Craig Woodman (Brentford). 24:59 Attacking throw-in by Danny Andrew (Cheltenham). 24:49 Attacking throw-in by Keith Lowe (Cheltenham). 24:21 Attacking throw-in by Craig Woodman (Brentford). 23:11 Shot by Jeff Goulding (Cheltenham) right-footed from right side of penalty area (18 yards), missed left. Goal kick taken long by Simon Moore (Brentford). 22:14 Attacking throw-in by Craig Woodman (Brentford). 21:22 Nicky Forster (Brentford) caught offside. Indirect free kick taken right-footed by Scott P Brown (Cheltenham) from own half, resulting in open play. 20:34 Attacking throw-in by Craig Woodman (Brentford). 20:30 Attacking throw-in by Craig Woodman (Brentford). 19:42 Foul by Shaun Jeffers (Cheltenham) on Craig Woodman (Brentford). Direct free kick taken right-footed by Pim Balkestein (Brentford) from own half, resulting in open play. 19:08 Gary Alexander (Brentford) caught offside. Indirect free kick taken right-footed by Scott P Brown (Cheltenham) from own half, resulting in open play. 18:29 Cross by Sam Wood (Brentford), clearance by Martin Riley (Cheltenham). 17:58 Attacking throw-in by Craig Woodman (Brentford). 17:15 Attacking throw-in by Keith Lowe (Cheltenham). 16:24 Defending throw-in by Danny Andrew (Cheltenham). 15:42 Goal kick taken long by Scott P Brown (Cheltenham). 15:10 Shaun Jeffers (Cheltenham) caught offside. Indirect free kick taken right-footed by Simon Moore (Brentford) from own half, resulting in open play. 14:08 Inswinging corner from left by-line taken right-footed by Michael Pook (Cheltenham) to centre, clearance by Pim Balkestein (Brentford). 13:30 Shot by Joshua Low (Cheltenham) right-footed from right channel (20 yards), save (parried) by Simon Moore (Brentford). Inswinging corner from right by-line taken right-footed by Michael Pook (Cheltenham) to far post, clearance by Kevin O'Connor (Brentford). 13:21 Attacking throw-in by Danny Andrew (Cheltenham). 11:17 Cross by Robbie Simpson (Brentford), header by Karleigh Osborne (Brentford) from right side of six-yard box (6 yards), hit bar. Outswinging corner from left by-line taken left-footed by Craig Woodman (Brentford) to centre, clearance by Martin Riley (Cheltenham). 10:38 Shot by Frankie Artus (Cheltenham) left-footed from right channel (25 yards), save (caught) by Simon Moore (Brentford). 9:53 Goal kick taken long by Simon Moore (Brentford). 8:44 Cross by Danny Andrew (Cheltenham), save (caught) by Simon Moore (Brentford). 8:09 Attacking throw-in by Keith Lowe (Cheltenham). 7:24 Shot by Marcus Bean (Brentford) right-footed from right channel (20 yards), save (parried) by Scott P Brown (Cheltenham). Inswinging corner from right by-line taken right-footed by Kevin O'Connor (Brentford) to centre, clearance by Steve Elliott (Cheltenham). 6:44 Shot by Nicky Forster (Brentford) right-footed from right side of penalty area (12 yards), save (tipped over) by Scott P Brown (Cheltenham). Outswinging corner from left by-line taken right-footed by Craig Woodman (Brentford) to centre, clearance by Steve Elliott (Cheltenham). 5:59 Attacking throw-in by Danny Andrew (Cheltenham). 5:34 Attacking throw-in by Karleigh Osborne (Brentford). 5:13 Cross by Danny Andrew (Cheltenham), clearance by Karleigh Osborne (Brentford). 5:01 Attacking throw-in by Danny Andrew (Cheltenham). 4:32 Foul by Gary Alexander (Brentford) on Martin Riley (Cheltenham). Direct free kick taken right-footed by Scott P Brown (Cheltenham) from own half, resulting in open play. 4:08 Cross by Nicky Forster (Brentford), clearance by Michael Pook (Cheltenham). 3:38 Defending throw-in by Craig Woodman (Brentford). 3:29 Attacking throw-in by Danny Andrew (Cheltenham). 3:04 Cross by Michael Pook (Cheltenham), clearance by Karleigh Osborne (Brentford). 2:28 Inswinging corner from left by-line taken right-footed by Michael Pook (Cheltenham) to centre, save (punched) by Simon Moore (Brentford). 2:06 Attacking throw-in by Danny Andrew (Cheltenham). 1:13 Cross by Joshua Low (Cheltenham), clearance by Marcus Bean (Brentford). 0:10 Attacking throw-in by Craig Woodman (Brentford).